Indulge in a little luxury and freshen your bedding with this set of two Euro shams from Echelon Home. Inspired by the soft and sophisticated appeal of hotel linens, this set of two shams features the subtle contrast of light-colored stripes against a crisp, clean white. Choose a hue to set the tone for your master bedroom. Drift off to sleep on the comfort provided by a300-thread-count, cotton construction, which lends incredible wear and machine-washable maintenance. Large enough for king-sized pillows, this sham fastens with a flap closure, creating a smooth, even look on your bed. They are white white and the piping is so well done. They really pruced up my bedroom. 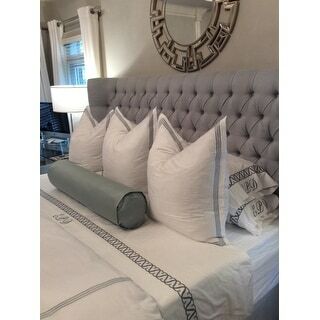 I paired them with the white cotton down and feather sqaure pillows. I recommend getting the pillow a size bigger than the sham for a really professional look. These Euro Shams are as pictured . Nice material but they do need to be pressed which is tricky since they have a little extra fabric in the back so that they don't lie smooth. This happens when the back and front are not cut at the same time and if one side is cut slightly on the basis. I ordered these covers to match the duvet set. They are a great value and look amazing. I thank you for the arrival of my new Euro Pillow Shams. I am totally pleased with the feel,the design and the color. I purchased them for my office daybed and I absolutely love them. I will be purchasing a set of sheets in the Echelon Home Three Line Hotel Collection... I love, love, love my new shams. Thank you! 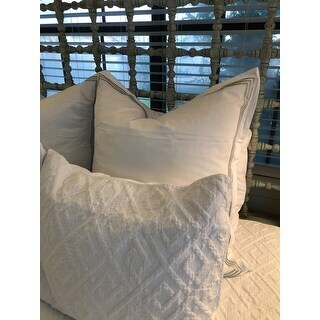 These are nice shams, but don't really fit the regular pillow, but would be good for the Euro shape pillows. The shams are soft and the three line design is nice. I will purchase another set in another color. I was looking for something classy and simple with just a touch of grey and these are it. I aloe ordered the duvet set. The material is very soft with just a slight sheen- very elegant. I would highly recommend bother the Euro shams and the duvet set if you're looking for simple sophisticated style. These are nice pillowcases, but they aren't euro shams. If you need euro shams, don't order these. These are great euro shams! 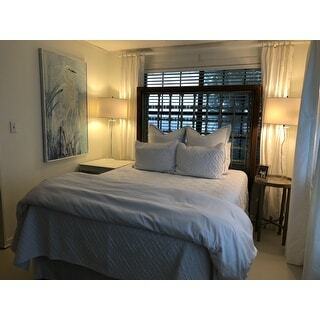 I ordered the silver blue and they work perfectly in our coastal bedroom. I haven’t taken the time to iron them but they looked pretty good even right out of the package. These are 26x26 shams and I put 28x28 euros in them. Very happy with this purchase! These are really nice euro shams which I bought for my two grandson's beds. I wanted a nice looking sham which goes with several designs of bedding and can be strong enough to withstand the roughness that children can have on bedding. These are perfect. The material they are made of are nice and thick so as they won't tear if pulled on when children rough house with them. I love the border design so as they don't look plain. Very nice purchase. 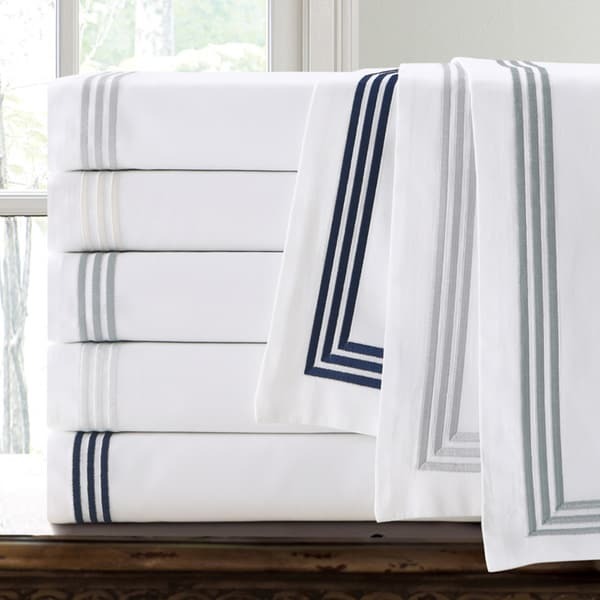 These euro shams beautifully complement my nautical themed bedroom. They are well made and the fit is perfect. Soft white material (much like sheet fabric) with perfect navy blue detailing around outside edges. I highly recommend them to anyone wanting a simple yet eloquent addition to their bedding set. the pillow cases are very hard to find to fit a 26 x 26 Euro pillow. these are perfect and fit wonderfully. Too thin and gray border does not show because the shams are very flimsy and the tops fold back. Matches the duvet cover, the cases are quite thin but they do the trick. The material is very soft and would be great for pillowcases but for shams they do not hold up the surrounding border very well, but rather flop forward a bit. Looks very pretty on the bed but not sure how long they will hold up due to the weight of the fabric. Nice addition to complete my set. Love the square pillow. The size, style, and price for these were exactly what I was looking for hence the four stars. The quality of the cotton is sturdy, however, they have a satiny sheen on them that I do not love. I wish they were more of a smooth brushed cotton. These are soft and are made from good quality fabric. I would recommend these. These shams were very high end and worked perfect with my comforter set. I would definitely recommend them. Seems a little thin but I used these in a guest room so they will likely hold up. "Is the Echelon Home Three Line Hotel Collection Cotton Sateen available in a standard sham size (set of 2)?" No, the standard shams are not available alone.